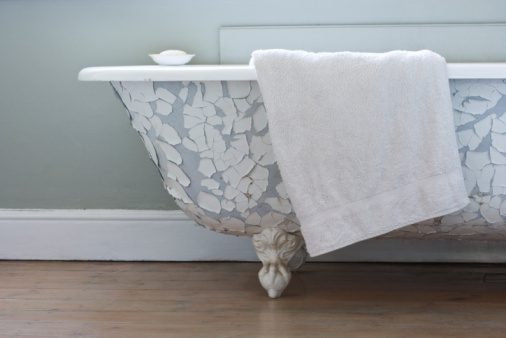 Bathtubs typically feature porcelain lining on top of steel or cast iron. Porcelain tends to be a durable material, but it is still susceptible to dulling of the finish. Older porcelain tubs might not be as alkaline- and acid-resistant as the newer bathtubs, making them even more likely to become stained. 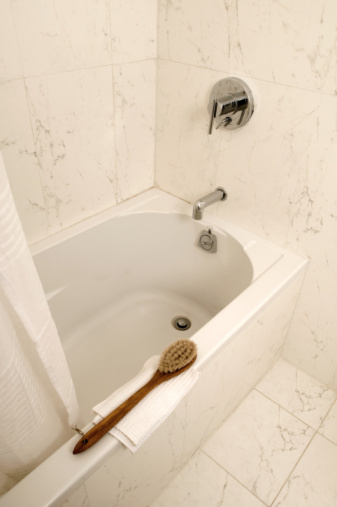 Whether your porcelain tub is old or brand new, it must be cleaned on a regular basis to simplify ongoing maintenance. Porcelain bathtubs need regular cleaning. Scour your porcelain tub. "Everyday Cheapskate's Greatest Tips" suggests mixing 1 cup of baking soda with 1 cup of salt. Keep this mixture in a sealed plastic or glass container. Scour your tub once a week using this mixture and a soft cloth. Rinse your bathtub thoroughly with warm water. Dry with a soft cloth to prevent water stains. Remove minor stains. Fill a small bowl with cream of tarter. Slowly, add just enough hydrogen peroxide to make a thick paste. Apply this mixture to stains and let the paste dry thoroughly. Rinse the mixture with warm water and dry your tub with a clean cloth. Treat stubborn stains with oven cleaner. The Reader's Digest Version website suggests spraying the stained sections of your porcelain tub with a commercial oven cleaner. Let the cleaner sit for two to three hours to give it time to draw out the stains. Rinse your bathtub thoroughly and dry with a soft cloth. Remove rust from your porcelain tub. Surface rust usually comes off during weekly scouring, but stubborn rust stains often need a commercial rust remover. Follow the directions on the product's label. Add shine to your clean porcelain tub. Squeeze lemon oil onto a soft cloth and rub the sides of your bathtub. The lemon oil also forms a protective coating that helps stop water spots, soap scum and minor stains. 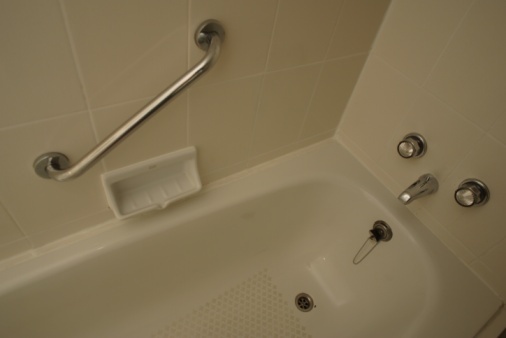 Avoid rubbing the oil on the bottom of the tub because it can be quite slippery.